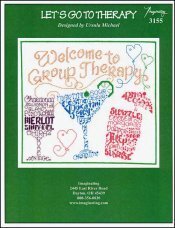 Let's Go To Therapy [J1216] - $6.00 : Yarn Tree, Your wholesale source for cross stitch supplies. Cross stitch chart from Imaginating. Designed by Ursula Michael. Cheers! It's time for some group therapy! "Welcome to Group Therapy," is stitched at the top of this design. A wine glass made with words that describe wine is the first glass. The second glass is a martini with words that describe a martini. The last glass is pina colada, made with words that describe a pina colada. Stitch count 131v x 116h. Stitched on #2936 Zweigart Aida 14ct. White.